The Galaxy S II was a big seller for Samsung and it lives on in 2013 with a brand new variant - the Samsung Galaxy S II Plus. Just like the Galaxy S Plus last year, the S II Plus launches with a revamped design, updated OS and new chipset. The Samsung I9105 Galaxy S II Plus runs Android 4.1.2 Jelly Bean with Nature UX and is powered by a chipset with a dual-core Cortex-A9 processor clocked at 1.2GHz, a Broadcomm GPU and 1GB of RAM. 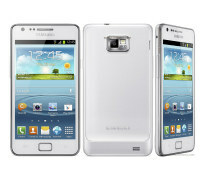 It packs the same 4.3" WVGA Super AMOLED Plus screen as the original Galaxy S II. Other things are the same as well - 8MP main camera with 1080p video recording (but with promised zero shutter lag), 2MP secondary camera, 3G with 21Mbps HSPA+, dual-band Wi-Fi a/b/g/n, Bluetooth 3.0+HS. Built-in storage has been cut down to 8GB, but the microSD card slot remains. There's optional NFC too - the I9105 S II Plus without it is 8.5mm thick while the NFC-enabled I9105P is a hair thicker at 8.9mm. The other dimensions are 125.3 x 66.1 regardless of model, that's the same as the original. At 121g it's a bit heavier though (the classic Galaxy S II is 116g). The battery is the same at 1650mAh capacity. What has changed is the exterior - it now uses the same hyperglazed plastic as the Samsung Galaxy S III and is available in Chic White and Dark Blue. We have hands-on photos of the Blue version. Check out our gallery if you want to see more. While the Samsung I9105 Galaxy S II will pack the latest Nature UX features like Smart Stay and Page Buddy, the original I9100 Galaxy S II will be getting Jelly Bean soon with most of the same features. Then there's the I9100G Galaxy S II model, which uses a TI OMAP chipset instead. There's no launch date or pricing info on the Samsung I9105 Galaxy S II Plus yet. I just bought my Samsung Galaxy SII plus a month ago and gives me a real satisfaction when it comes to downloading applications, web browsing and specially the 8MB camera. Handy, user's friendly and the blue color is quite nice and elegant. 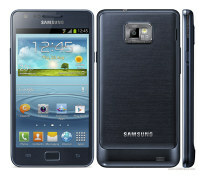 After Apple sued samsung 2 years back, i personally did not think samsung would continue strong BUT here they have brought a 2nd edition of the Salaxy SII which is a pretty smart move as the android is hot in demand.